In the competitive ecosystem, knowing your target audience properly is the key to have a competitive edge. The more information you have about your customer, the better it is to ensure at par user experience. Prestashop Custom Form for Registration allows the store admin to create N numbers of custom fields on the registration form. The field type and the validation rules can be set by just making few changes from the backend of the module. The already created field can be edited when required from the admin panel. The store owner can select the fields that he wants to display on the website. The Prestashop store admin can enable or disable the plugin on the store at a button click. 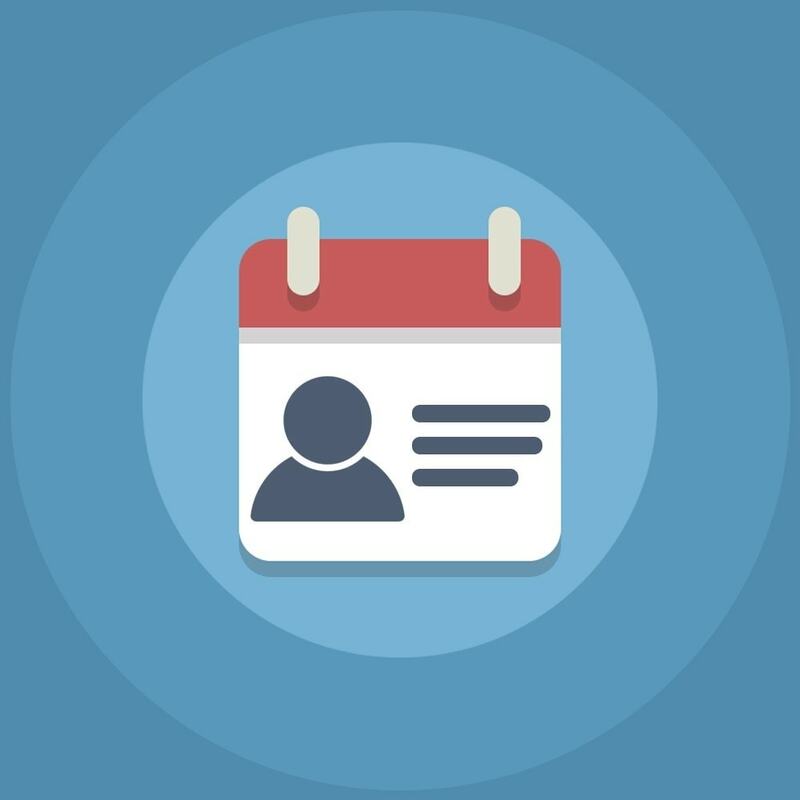 The uncomplicated way to create custom field allows the store admin to structure a standard registration form on the eCommerce website. 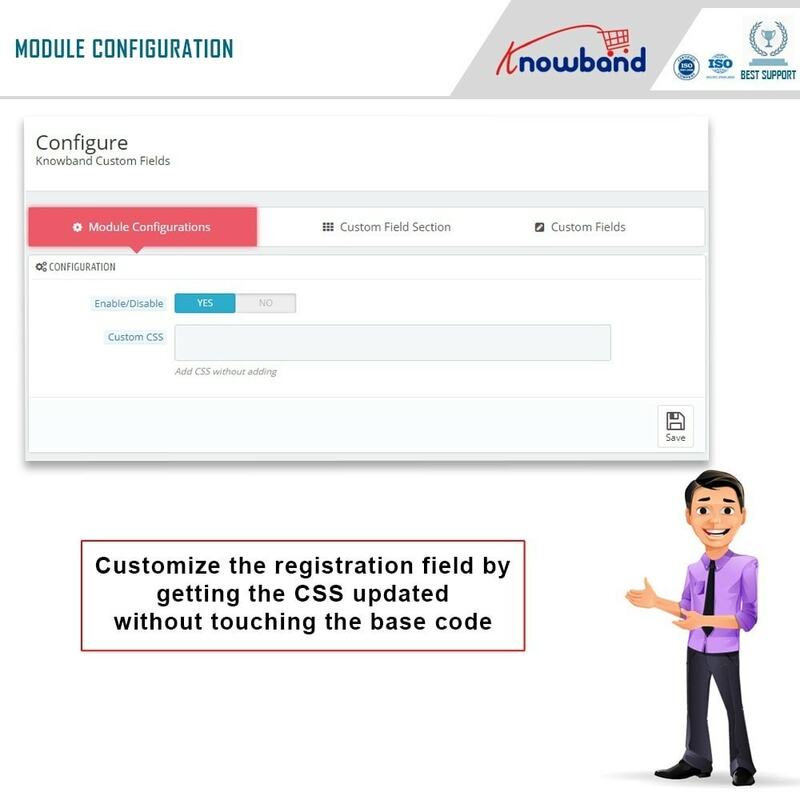 The web admin panel allows the e-merchants to add the text field, drop down menus, checkboxes, radio button and many other functionalities on the registration page in a moment. 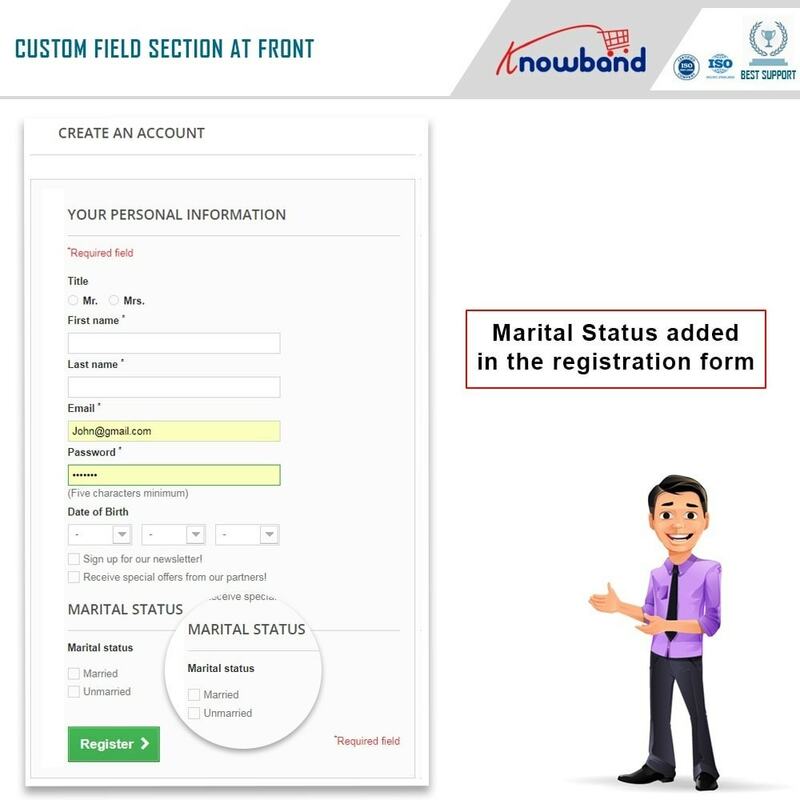 Easy customization: The custom field for registration form module ensures that the work is done with minimal effort and time. The custom fields can be added to the registration form by just making few changes and selections at the backend of the admin panel. The fields created on the forms can be displayed on hidden in the front end. GDPR Compatibility: This module is compliant with official Prestashop GDPR module. The admin can enable/disable this feature. By enabling this will allow the export and delete the user data on Prestashop GDPR module request. 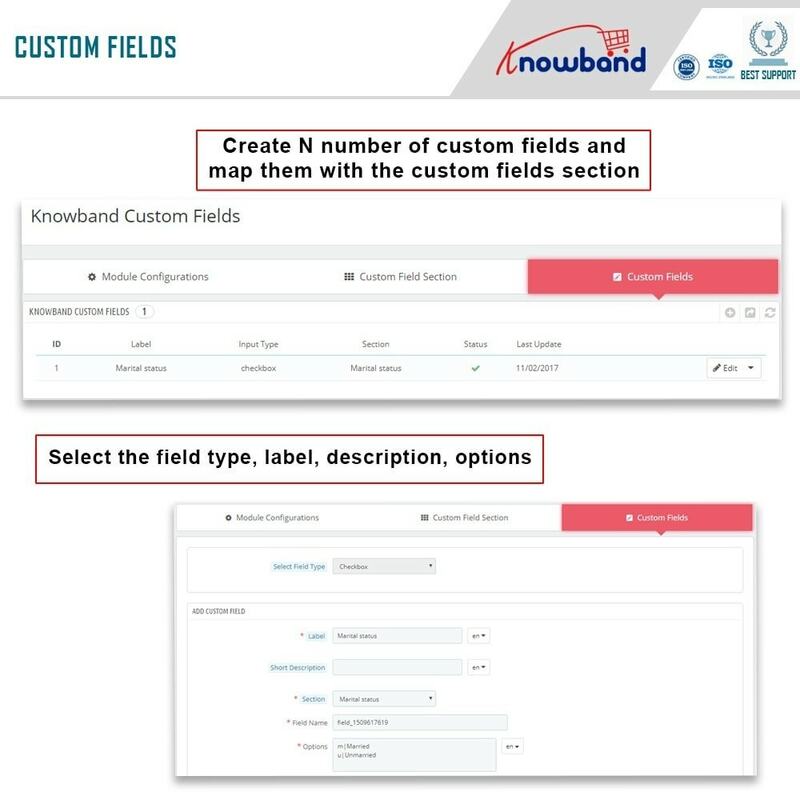 Effortless field addition: The custom fields can be added with just a button click. The admin will be required to select the type of field from the choices offered. PrestaShop Registration Fields Module offers the below-listed types to choose from. Field Personalization: In this Prestashop Custom Fields module, the label name, description and other edition of the fields can be done from the back end of the admin panel at a few button clicks. Custom CSS: In this Prestashop Registration Fields module admin even gets an option to change the look and feel of the various fields by entering the custom CSS code. Validation Rule: The admin can set the validation type and fix the validation rules for the various fields in the registration form. 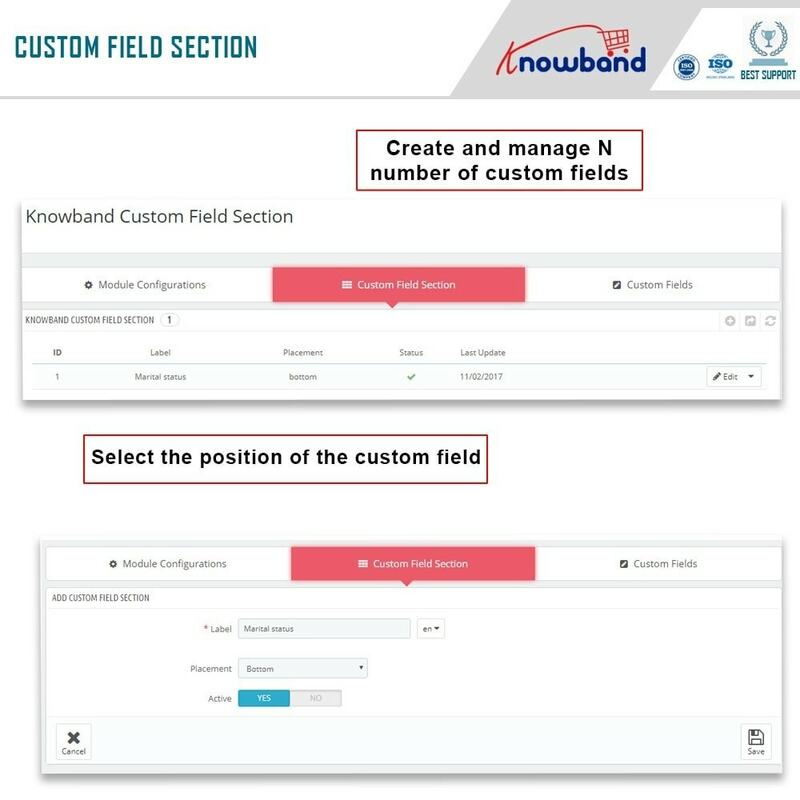 The Required field validation can be set on the mandatory field by just enabling the functionality at the backend. Restrict the number of characters: The length of the characters to be entered in a particular field can be restricted by the Prestashop store admin. The maximum and the minimum length can be fixed. Excel export: In addition to this, the Custom Registration Fields module even offers an option to export all the fields in an excel sheet. This helps the admin to keep a track on the customer’s account page. Multi-lingual support: The Prestashop Custom Fields module supports multiple languages. The admin can now enter the various fields in the form in varied languages. The customer can provide the relevant information to the website. The various validations allow the customers to check the mistakes while filling up the form. Prestashop store admin can enter a short description of the various fields. This provides a better understanding of the customers. The customers get to view the registration form in their desired language.